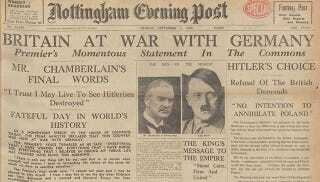 It was on this day in 1939 that Great Britain declared War on Germany, a momentous decision that was reached just two days after the invasion of Poland. Here's a sampling of the newspaper headlines and news reels that greeted the world on that fateful day. At 11:15 a.m. British time, Prime Minister Neville Chamberlain announced that his country's deadline for the withdrawal of German troops had expired, and that "consequently this nation is at war with Germany." That was the moment when the regional conflict expanded to global scale. Within hours, several other countries joined in, including Australia, India, and New Zealand (Canada entered the war one week later). France's ultimatum expired later the same day.